Boston's outer harbor is dotted with islands and crisscrossed by sandbars that make it a potential nightmare for mariners. One meandering spit extends more than a mile from Great Brewster Island to the southwest, ending near the southeast end of Lovell's Island. The spot marks the entrance to the Narrows Channel, once the main route into the inner harbor. As early as 1778, charts showed an unlighted beacon at the end of the spit. In 1854, Congress appropriated $15,000 for a proper lighthouse. Harrison Loring was hired to build the lighthouse, which resembled a large bug on seven iron stilts -- hence its nickname, "Bug Light." The hexagonal wooden dwelling on a screwpile foundation had a galvanized iron roof. 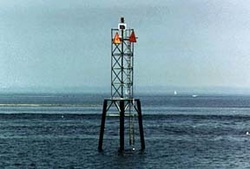 A sixth-order Fresnel lens exhibited a fixed red light, about 35 feet above sea level and visible for seven nautical miles. Nathaniel R. Hooper was the first keeper when the light went into service in 1856. There was also a fog bell with striking machinery on the side of the lighthouse, which struck a single blow every 20 seconds in times of poor visibility. An ice-breaking structure was added and was subsequently swept away by the sea; it was rebuilt in 1867. It consisted, according to the annual report of the Lighthouse Board, of "oak piles secured with girders ballasted with stone, planked all over, shod with iron, and painted with red lead." James Turner, who was rumored to be a pirate and murderer, was said to be an early keeper of the light. In the 1940s, local historian Edward Rowe Snow learned that Turner may have buried treasure on the islands. Snow subsequently found an ancient book in a cellar on nearby Middle Brewster Island. Pinpricks above certain letters on a page in the book spelled out a clue when read backwards: "GOLD IS DUE EAST TREES STRONG ISLAND CHATHAM OUTER BAR." Snow and his brother Donald, with the help of a metal detector, eventually found a small chest full of coins on Cape Cod, an event which made national news. In 1891, a new, wider gallery was built around the dwelling. At the same time new outer stairs were added. A 600-gallon water tank was installed in 1900. Shipping mishaps near the lighthouse were not uncommon. During a thick snowstorm in early December 1907, a fishing dory went aground on the spit with four men aboard. The men were saved by the quick actions of a lobsterman living in a cabin on Great Brewster Island. 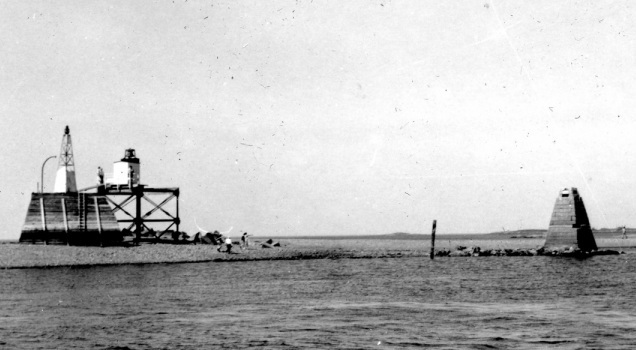 A fishing schooner ran into the spit during bad weather on New Year's Day in 1914. The vessel was returning to port from the fishing grounds with 45,000 pounds of fish on board. The 23 crewmen escaped without incident as the vessel quickly filled with water. Gershom Freeman became keeper in 1895. A housekeeper, a Mrs. Tenney, moved into the lighthouse, and her young son, Francis, made a dory trip to Georges Island and then on to Boston every day for school. If a storm came up, he'd stay at Georges Island until the weather improved. The housekeeper was there for the memorable Portland Gale of 1898. She said that the stones striking the structure's iron legs sounded like strange music, as every leg had a different pitch. The icebreaker was destroyed by the storm and shingles were blown from the dwelling. Two brothers, Tom and Arthur Small, served as keepers. During a winter storm in 1923, a fishing boat went ashore on the bar near the lighthouse. Arthur Small managed to get a line out and pulled two of the men to safety, but the third man perished. Tom Small's boat capsized during a trip from Boston Light one day. The visibility was low and a lifesaving crew from Hull couldn't find him, but Arthur Small found his brother clinging to his overturned boat, his wool mittens frozen to the keel. Tom Small later said he had nearly given up hope, but the thought that "a shipwrecked sailor gets a drink of rum" kept him going. Around noon on June 7, 1929, Tom Small was near the end of a weeklong project involving the removal of paint from the structure with a blowtorch. A spark ignited a fire in the roof, and within 15 minutes the entire lighthouse was in flames. Small managed to throw a few belongings into a rowboat and narrowly escaped with his life as debris fell around him. The falling fog bell missed him by a few inches. By the time a fireboat made the seven-mile trip, it was far too late to save the lighthouse. Immediately after the fire, the crew of the tender Mayflower placed a gas-operated lighted bell buoy at the site. The base of the lighthouse stayed standing for a while, and an automatic light and fog bell were placed on top of it. Today, an automatic light on a small steel skeleton tower stands near the former location of "Bug Light." Nathaniel R. Hooper (1856-1861 and 1862-1871), C. J. Blair (1861-1862), Charles J. Hooper (1871-1872), Daniel McKenzie (1872-1877), Frederick Hammond (1877-1878), E. Lewis Gorham (1878-1882); George G. Bailey (1882); Charles Friend (1882-1888); Charles E. Turner (1889-1892); Michael J. Curran (1893); Samuel E. Liscom (1893-1895); Gershom C. Freeman (1895-1907); William H. Lowther (1907-? ); Arthur Small (c. 1919-1922); Tom Small (1922?-1929).